Wrist arthrodesis is a salvage procedure to provide the patient with the pain-free immobile wrist in maximum functional position. Arthrodesis means the fusion of the bones. After arthrodesis or fusion, motion between worn joints is eliminated and so is the pain. As noted before, wrist joint is a salvage procedure. Because it needs to sacrifice motion, other options of treatment must be considered and discussed with patient wherever feasible. 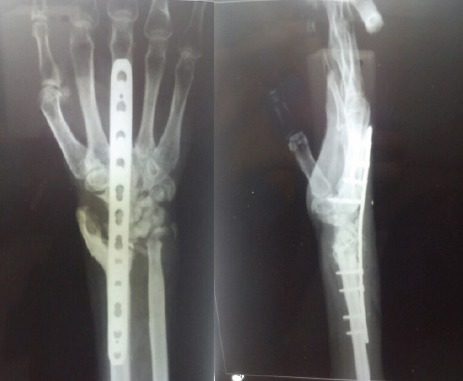 The compression plate is used to fix the fusion and spans from the third metacarpal to distal radius. The wrist is generally fused in 10 degrees of dorsiflexion. Lunotriquetral, capitate-hamate, triquetrum-hamate [ulnar sided joints] are fixed if there is significant arthritis in these joints at the time of operation. Plate tenderness forcing implant removal. Wrist arthrodesis provides good pain relief and correction of the deformity. Patients can perform most of the activities of daily living. Problem is experienced in negotiating hand in tight spaces and executing some positions of the hand.